Eli Slater has worked hard to overcome his family’s past and repair the damage they caused. A new light comes into his life in the form of security specialist Kathleen Callahan. Even though she rejects him and everything he makes her feel, Eli is relentless in his pursuit, determined to make her his own. Darkness has a way of finding and destroying light and Eli learns his family’s troubles are far from over. Dealing with threats and attempts on his own life is one thing but when those he loves are threatened, it’s a whole new game. And he’ll stop at nothing to win. But evil has a familiar face, along with an unimaginable goal of destruction, putting both Eli and Kathleen in the crosshairs and threatening the happiness they never believed they’d find. Thoroughly enjoyed this series. Extremely well thought out plots and storyline . Great heroes and heroines. Well worth reading. The first three books in the Grey Justice series. I have read each of these when originally released. They are action-packed with thrilling suspense storylines. NOTHING TO LOSE, Book 1 Married to Narcotics Detective Thomas O'Connell and expecting their first child, Kennedy O'Connell finally has her happiness after a rough upbringing. Then someone takes it all away. She decides to make those responsible pay. Her husband’s best friend, Detective Nick Gallagher, also wants them to pay but not at Kennedy expense. Billionaire philanthropist Grey Justice also has an agenda to make them pay but needs Kennedy’s help to take them down. 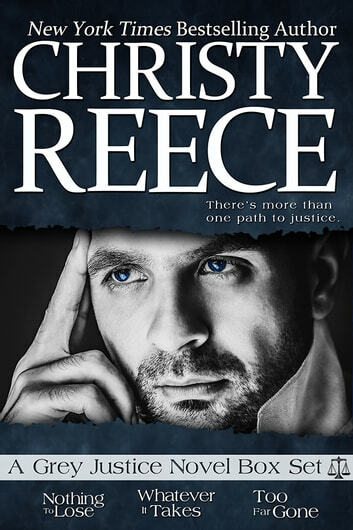 This is the first book in Christy Reece’s newest series. Action packed with well written characters and suspenseful storyline. Cannot wait for more books in this series and learning more about Grey Justice and Irelyn and what has led them onto to this path. WHATEVER IT TAKE, Book 2 The second book in the Grey Justice series features Eli Slater who has repaired the damage his father and older brother created and is working to restore his family name. He is a hands-on father who will do whatever he has to do to protect his children. Kathleen Callahan is seeking justice for her sister’s murder charge and comes to Eli’s attention via a news report. He is captivated and fascinated by her. With the help from his friend Grey Justice and a bit of manipulation from Eli, Kathleen finds herself working with Eli along with Grey Justice to find out who is threatening his family. Little do they know, Kathleen is also a target. Nick and Kennedy Gallagher, book ones’ hero and heroine, are also assisting with their expertise. Grey and Irelyn are not as prominent in this book but there’s enough in there to keep you guessing on their past and wanting more from them. While this can be read as a standalone, I highly recommend reading book 1, Nothing to Lose to get the full backstory. Christy is a wonderful writer who stories draw you in and leave you breathless. She consistently delivers great romantic suspense novels. The story keeps you enthralled and is a page turner. One of the many things you can expect from a Christy Reece novel is that they are full of “meat”. So many twists, turns, surprises, and suspense. To me, she does not produce a once read and done novel. There’s much to mull over and are thrilling to read. 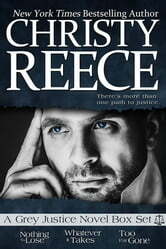 TOO FAR GONE, Book 3 When I open a Christy Reece book I know I’m in for a treat. She consistently delivers quality novels that immediately draw you in and the life around you does not exist until you’ve read the last word. I know that I’m going to be entertained the entire book and by the end there’s a smile for the HEA and usually a shocked look on my face by what Christy has just done. Christy creates the most vile and twisted villains. She writes strong women characters (and men too) who fight fierce and love just as fierce. Too Far Gone is action-packed and keeps you on the edge of your seat. Just when you think you know the ending and how it’s going to wrap up, you get a twist you would never see coming. Intriguing read with likeable and developed characters. Christy does a great job weaving high-action suspense with romance. I often fall in love with Christy’s leading men and Jonah is no exception. He is strong, gruff, stubborn, as well as a kind and caring protector with a big heart. Gabby has had a real rough life and she could have become a useless wallflower. Christy instead made her warrior full of courage with a need to experience life and independence. Gabby has become a favorite character of mine. To Far Gone is a fantastic addition to the Grey Justice series. I highly recommend this book as well as all of Christy’s books (Grey Justice series, LCR series, LCR Elite series, and her Wildefire series written as Ella Grace).